Despite being raised in Boulder Colorado in the midst of the Sixties, I had a normal childhood. My parents did not repress my creative instincts, so I did not seek an artistic education. Instead, I earned a BA in history from the University of Colorado in 1986 and a JD from the University of Oregon in 1989. I practiced law in Oregon and Idaho between 1989 and 1996. In 1994 I did what most young lawyers do --- I married another lawyer. Stephen is sweet, occasionally grumpy, handsome --- a collector of books and arcane knowledge. Together we decorated our home in books. In 1997 we moved to Colorado and I left the working world to raise our first daughter. I was a workaholic at loose ends. Sweet, cuddly and bright-eyed though she was, Georgia was no substitute for a real job. So I went to work on our home. I gardened; I remodeled; I plumbed; I rewired. When we moved to Salem, Oregon, three-year-old Georgia was convinced I had built our new home. Soon home improvement wasn't enough. My interest in the creative arts blossomed and I began to quilt. After fooling around with traditional patterns, I began making medulla quilts out of many tiny scraps of symmetrical fabrics. 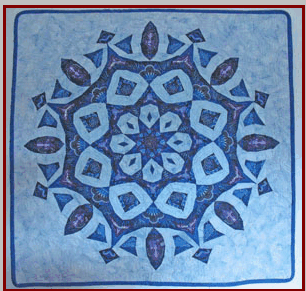 Kaleidoscopic quilts became my passion. If Georgia grew up amid the sawdust, her younger sister Paula grew up amid heaps of fabric. Then I decided to try my hand at making real kaleidoscopes. 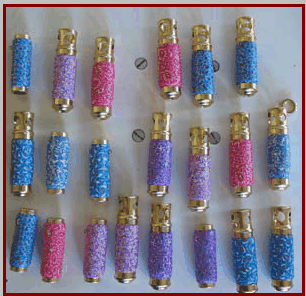 I found lovely wooden tubes to use for the bodies, but I couldn't find end-caps to fit them. A friend suggested I make the end-caps out of polymer clay. "Polymer what?" I said. She was right, polymer clay did make beautiful endcaps. 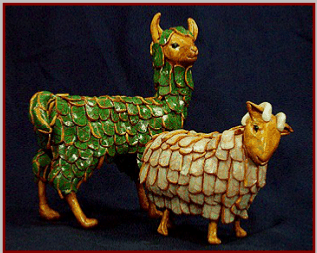 Better yet, polymer clay canework lends itself to kaleidoscopic images. I fell in love with the medium, especially canework. I made incredibly intricate canes for the sheer joy of it. Soon I was decorating anything and everything with clay: pens, clocks, cigar-boxes, vases, small children. . . Overwhelmed by the artistic rubble, my husband finally pleaded with me to either stop --- or to get serious and start marketing my work. I began to sell my work at craft fairs. Before long mere decoration was not enough, and I began to sculpt. Using my canework to decorate my own sculpture was the obvious next step. Unfortunately by then there was hardly room left in the house for our books, my artwork and the children. We found a new house with a bigger yard, a basement, a shop, and a loft over the kitchen. We added a playroom for the children; I made the loft over into a full-time studio and took over much of our new workshop. I now show my sculpture at seven to ten fine art shows a year in Oregon and Washington. But my interests continue to evolve. In 2006 and 2007 I taught myself to draw portraits. Not satisfied with black and white I began to paint. After several false starts I painted my first reasonable watercolor. Since then I have been obsessed with watercolor, sometimes producing as many as five paintings a week. I will continue to sculpt, but watercolor is my joy and my passion. 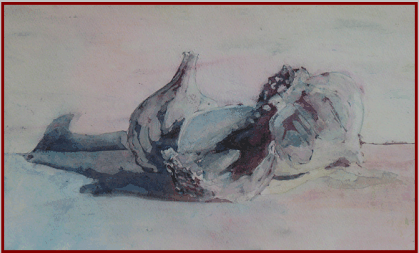 My First Watercolor: "Three Garlic Heads"